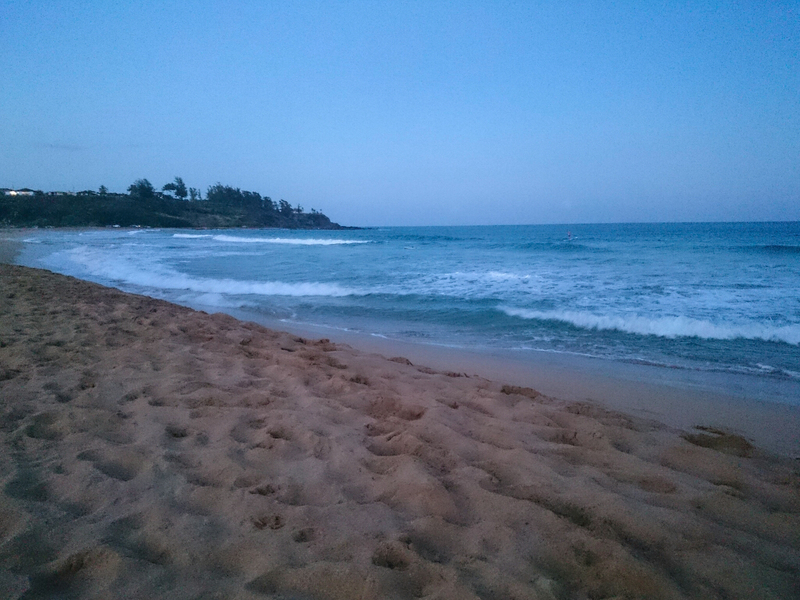 It was rather uncommon for me to be able to go to the beach in winter but I must say I quickly got used to it. 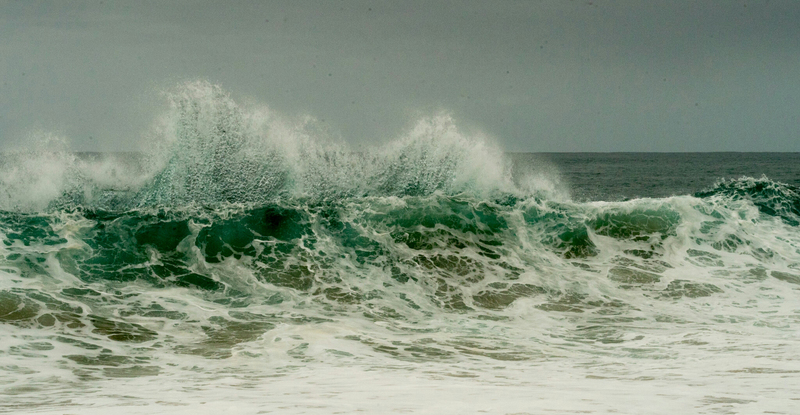 At this time of the year, the ocean is not the calmest, still offering beautiful views. Glass beach (in Port Allen) almost doesn’t count because it can’t even really be called a beach. Located on the South shore and right next to a refinery, it’s not a place that you can go to expecting to lie down, sunbathe and go swim. 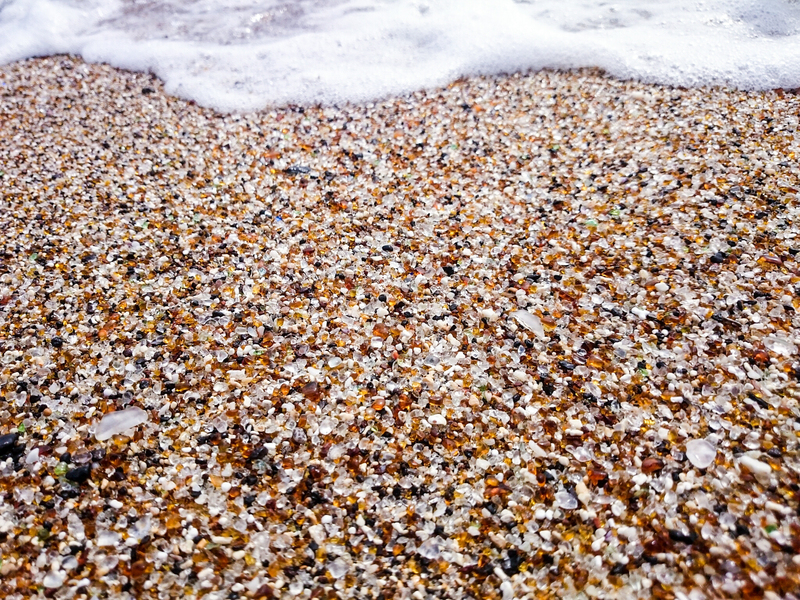 All kinds of junk used to be dumped in the area and at least one nice thing came out of it – the beach is now made of sea glass. I’m including it in this list as a nice stop if you are in the area. 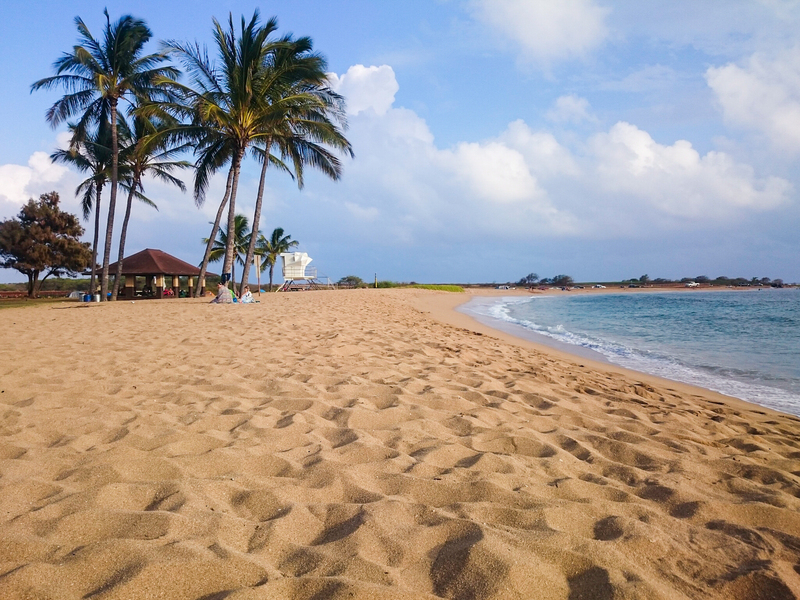 In the South of Kauai, not so far away from Glass beach, Salt Pond is a pretty beach lined with palm trees. We liked it enough to spend some time there but there wasn’t really anything special about it. When we were there, we noticed some kind of event was happening and then realised it was a gathering in favour of the independence of Hawaii. 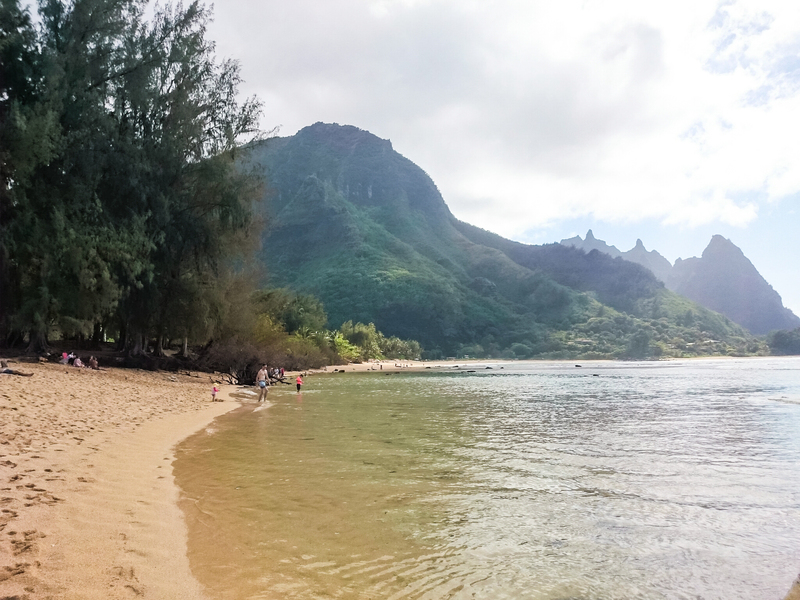 We landed on Kalihiwai beach a bit by accident. We were trying to go to Hideaway beach in Princeville but we never found the hidden path that leads to it… so we drove to Kalihiwai instead. It is probably not as secluded as Hideaway but it shows pretty colours. Kealia beach was the beach we liked the most nearby Kapaa town, where we were staying. The water is usually pretty agitated but the beach is beautiful. It is said to be a good spot to have a peek at whales in the distance during the winter months although we never saw any during our time there (in February). But it was also the perfect place to watch the moon rise, which was one of the most beautiful and magical things I had ever seen. Lumahai beach is one of the most picturesque yet dangerous Hawaiian beaches, especially in winter. I love seeing beaches by all weathers and we went to this place on a grey day so we don’t exactly see it as a popular and busy beach (which it actually is). 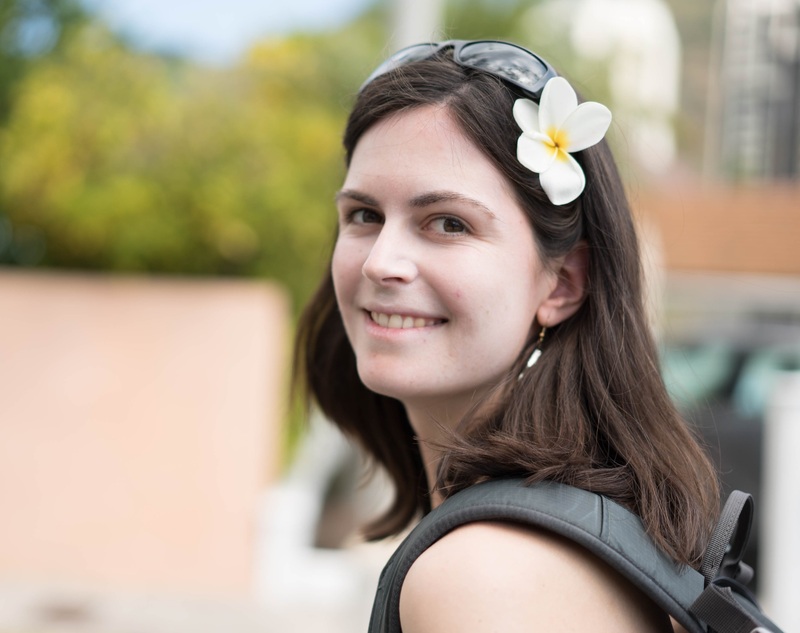 Apart from a couple of chickens (they are everywhere in Kauai!) and a surfer gauging the ocean, we had the beach to ourselves and loved it. Poipu beach was the first beach that we went to in Kauai and I was a bit sad to see how busy it was. 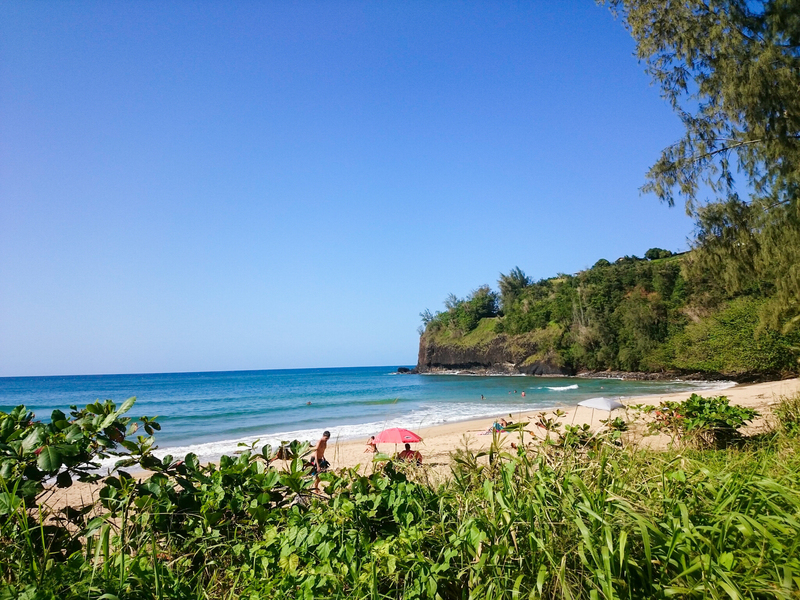 The nearby resorts make it easy to access and this pretty beach has become the most popular in the south of Kauai. 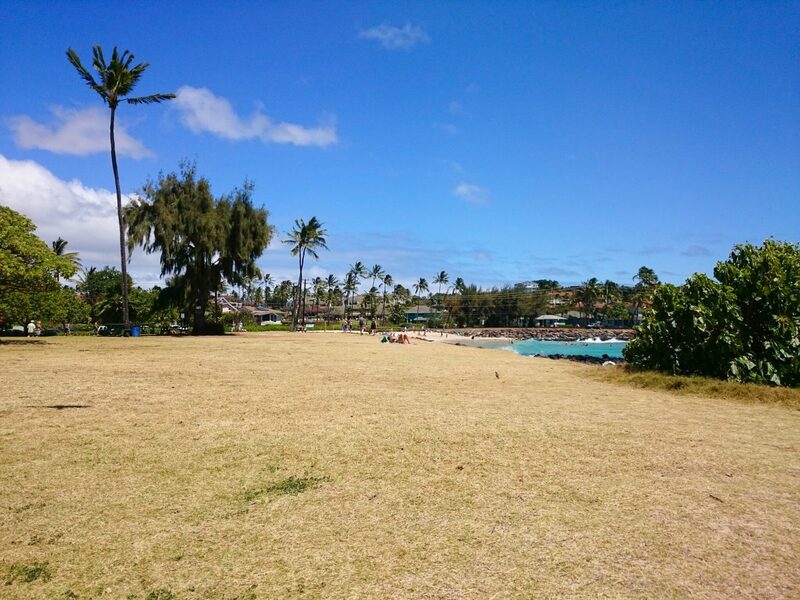 We eventually found a nice and quiet spot in Poipu beach park, away from the crowd and in the shade of palm trees to enjoy the postcard-worthy scenery. We were even able to spot turtles through the waves and dolphins in the distance. 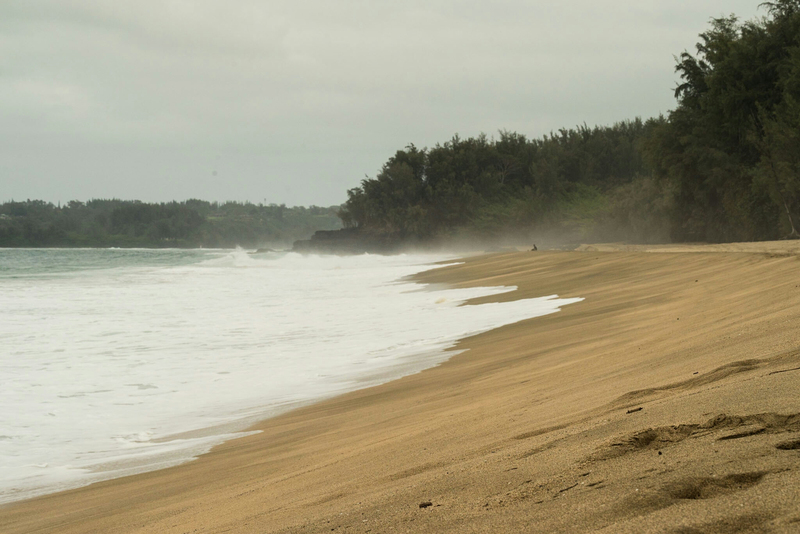 On the North shore of Kauai, Haena beach benefits a lot from its magnificent surrounding mountains. It would be very difficult not to fall in love with the scenery there. There is a cave across the road from the beach that you can quickly visit. 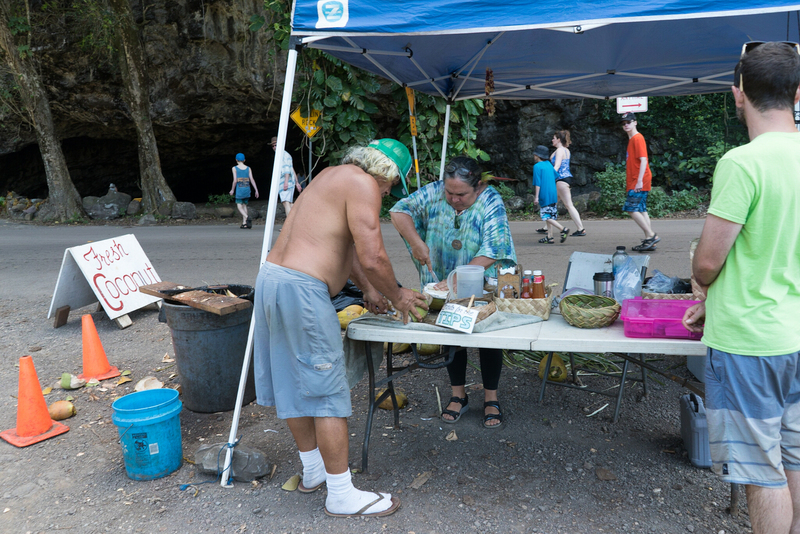 It was also the first time that I tried a fresh coconut. 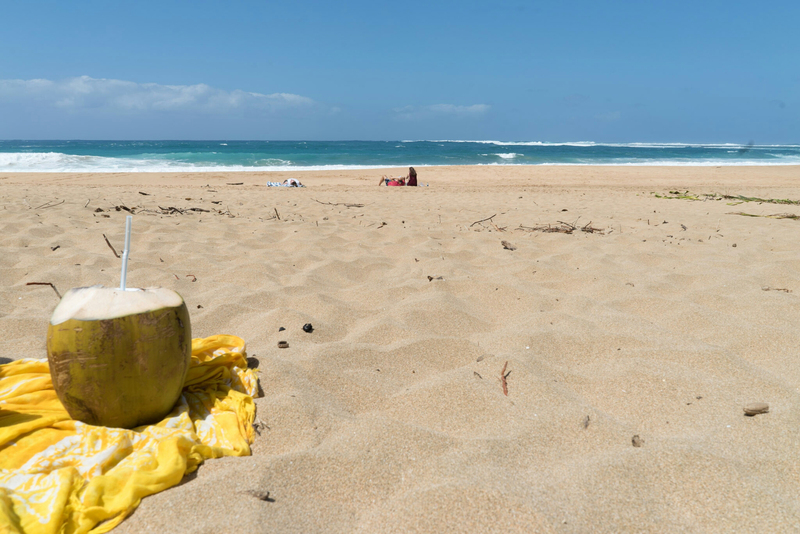 I have never been a fan of coconut water and haven’t really liked fresh coconut meat either but there was something enjoyable about having a fresh coconut on a Hawaiian beach! 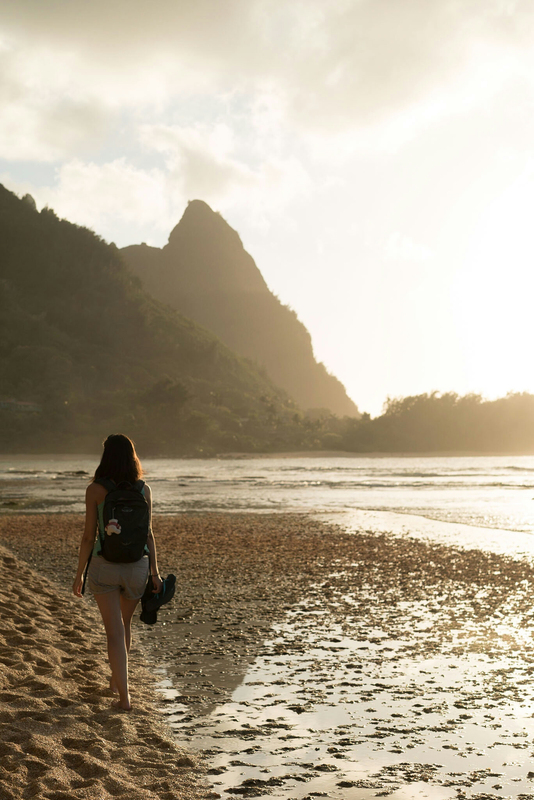 Located right next to Haena beach, Tunnels is another stunning Hawaiian beach, mainly from the incredible mountain views it offers. Thanks to a lagoon, the water is perfect for swimming too, although I heard stories about sharks and I weirdly felt good staying on the beach. We also enjoyed a beautiful sunset there. 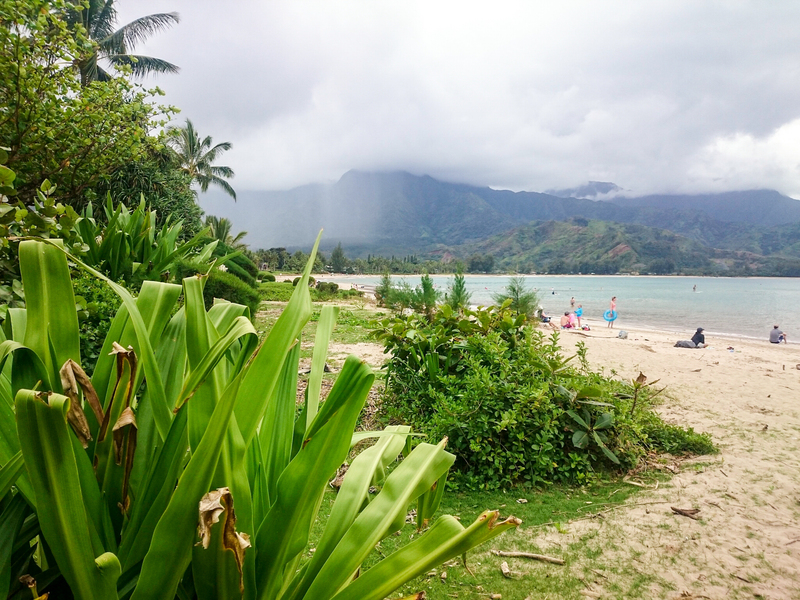 Hanalei beach on the North shore is one of the prettiest beaches in Kauai. It’s perfect for swimming, learning how to surf and offers spectacular views of mountains in the background. It quickly became Simon’s favourite beach there. 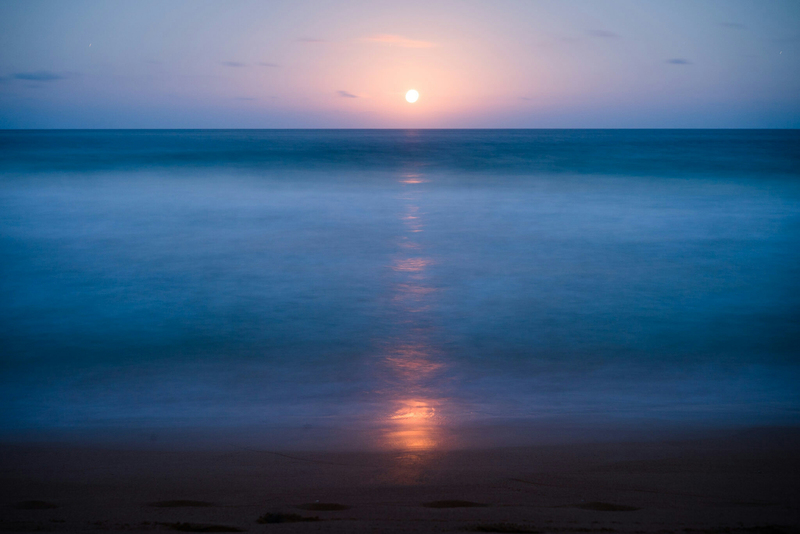 Polihale is my absolute favourite beach in Hawaii, and possibly in the world. Located on the West side of the island, it is not the easiest to access. The dirt road that leads to the beach is very long, bumpy and badly kept. It took us forever to drive through it as we were being extra careful with our rental car (yes, we rented a car even though we were on a budget in Hawaii!). You will find that this magical place is completely worth it. It’s not really the typical tropical beach lined with palm trees, but it was even prettier to me. 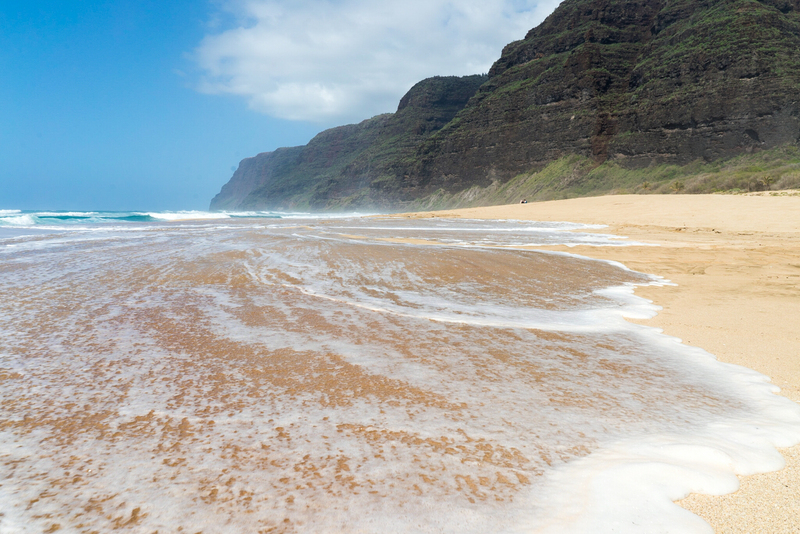 In addition to being practically deserted, this 7-mile long white sand beach offers views on the gorgeous Napali coast. It seemed endless and the water was quite wavy and with strong currents (definitely not good for swimming). It had a very particular atmosphere to it, it was impressive and really made the nature lover that I am feel very alive.